Ten year old Lilly is the victim of a terrible house fire and a wretched family. Her father is an addict with mental illness, her mother was murdered and then buried across the street, and her uncle got her addicted to heroin. Lilly’s tragic story has been told in the book All Smoke Rises, and it may be true, for the author has broken into your house, and placed Lilly’s body on your kitchen counter. He demands you read the manuscript, before cutting his own wrists and bleeding out on your floor. Now you have decisions to make, for her body may not be dead, and her family is coming for her. I don’t write horror to scare others, I write it because I am the one who is scared. When I write, my life of quiet desperation instead becomes an audible cosmic scream. The scariest part of All Smoke Rises, and its companion story, Milk-Blood, is that all of it is true. That doesn’t mean that there’s an actual ten year old girl who still hears the voice of her mother who was murdered, dismembered, and then buried in a shallow grave across the street. Who became addicted to heroin when her uncle felt it would ease her suffering. Who discovers that her true father is a schizophrenic, homeless man who had injected his dad’s ashes into his veins when he was craving his next fix. Just because these things didn’t happen, doesn’t mean they aren’t true. The urban decay, where abandoned, burnt-out houses stick out like a mouthful of jagged teeth. The isolation of being stuck in this dark bubble alongside the most despairing creatures the universe has to offer. The poverty where children get their best meals from school breakfasts. Addicts who crave heroin in their body the way a vampire craves blood. This stuff clearly exists. The inspiration for writing these books came from my own work as a substance abuse therapist. For nearly 20 years, I’ve worked with hundreds of addicts. Before this time, I harrowed in my own addiction. I woke up each day and my daily efforts were how to get high and get by. By the grace of the old Gods and the new, I now have 23 years clean and sober, but I have come to understand the immense power addiction has over the human soul. Real truth would be impossible to believe, and that’s why, I feel, horror writers make up stories. It’s the only way to express truth on the deepest level. Newspaper fiction has its limits, but when reality gets intense, when we pull out the magnifying glass and let the sun shine through and make it burn, that’s when you see it for what it is. The supernatural elements in All Smoke Rises are a way to give the urban decay and addiction a face and a name. The fact that families are out there, right now, trying to survive in these terrifying environments is, for me, the scariest part. “We are the monsters,” is how Kealan Patrick Burke puts it in the book’s introduction. Despite the dark and gruesome nature of All Smoke Rises, during the time it takes a reader to finish the book, (spoiler alert) more people will die from a heroin overdose than die in this fictional story. Truth is darker than fiction, and the best way to tell that truth, is to make up a story. Mark Matthews has a B.A. in English Literature from the University of Michigan, and is a licensed professional counselor who has worked in mental health and substance abuse treatment for over 20 years. His novel Milk-Blood, along with its companion short story, “The Damage Done,” have been optioned for a full-length feature film. 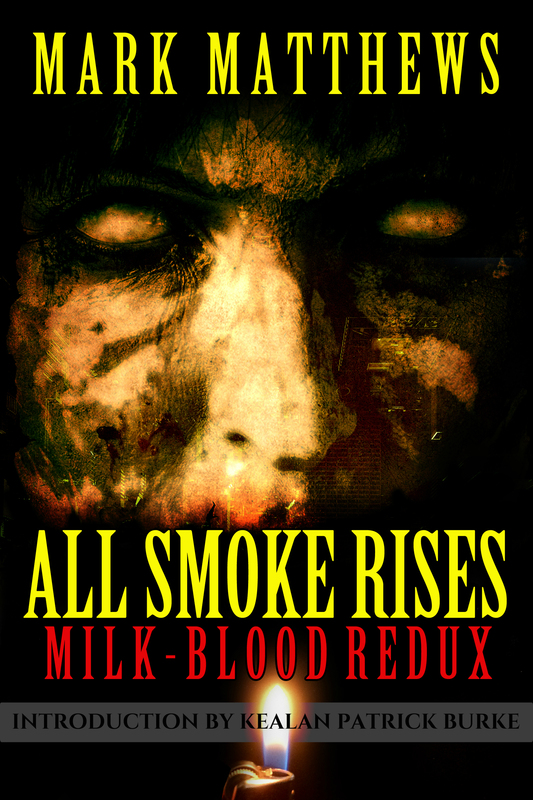 All Smoke Rises: Milk-Blood Redux is the follow up and was published on February 8th, 2016. He is the author of On the Lips of Children, from Books of the Dead Press, which was nominated as a semi-finalist for the 2014 Best Kindle Book Awards. Matthews lives near Detroit with his wife and two daughters. All of his books are based on true settings. Reach him at wickedrunpress@gmail.com. This post expresses exactly why I love Mark’s books.